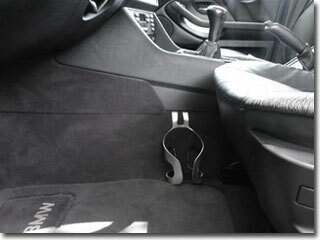 BMW Cup Holders, Porsche Cup Holders, Ultimate Cup Holder - Cupholders / Drink Holders for BMW 3 5 7 Series, Boxster 911 Z4 Mercedes Audi NSX other fine cars. 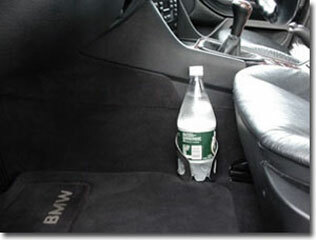 A practical cup holder designed for the real world by an owner who actually drives the cars and uses the holders. The ONLY cupholder that doesn't take any useable space or restrict any typical functions of your car. Out of the way and inconspicuous (more so in actual use than shown). Easy, slip-in installation and removal. Requires absolutely no modification or alteration to your vehicle. 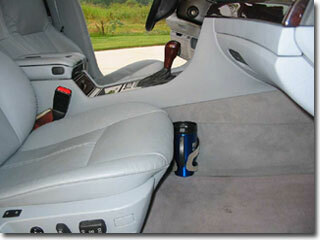 Low center of gravity, solid construction, and overall design keep drinks in place even in very "spirited" driving. Tired of holding or catching drinks as you go around corners? Go ahead... try to make anything in these tip. If by chance a spill does happen (most likely due to the container and not the holder), it will be on your mats, not on you or on your car's expensive electronics. Doesn't interfere with shifting or operation of dash, console, or other vehicle controls. Works on both driver's and passenger's sides. 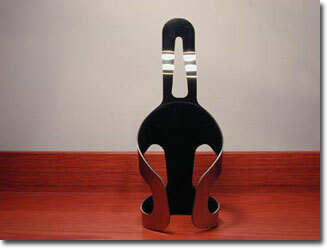 Designed to naturally accept drink containers - drop things in, and they center and stay in place. Unbreakable! No moving parts, no fragile little pieces to break. Quiet! Die-cut felt lining eliminates rattles. Low mounting position provides for improved safety and reduces potential for launching of contents in the event of an accident. Adjustable to fit a wide range of containers, from 12 oz. cans, to over 4.5" diameter mugs and one-liter bottles. Holds virtually anything, and holds it well. Lightweight, yet strong enough to hold any container. Solid all-metal, stainless steel construction. Precision CNC laser cut, then formed and finished by hand. Available in stainless with black lining and stainless with light gray lining. Also works with various models/years Acura, Audi, Honda, Infiniti, Lexus, Mazda Miata, Nissan, Saab, Volvo, and VW. Rear mounts now are available for the Fischer folding cup holders for use in BMW E39 5 Series and other cars with a similar rear console design. 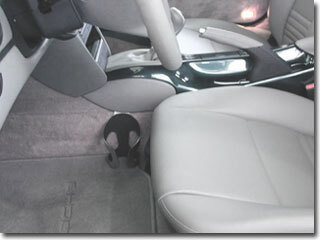 See the model status link for details regarding specific cup holder models and information regarding other vehicles. If not listed, then please ask. $24.99 + $5 shipping via USPS. Simple money-back satisfaction policy. If you're dissatisfied for any reason, then return it within 30 days and your money will be refunded promptly.